Tomorrow we release Snowfall, hurray! 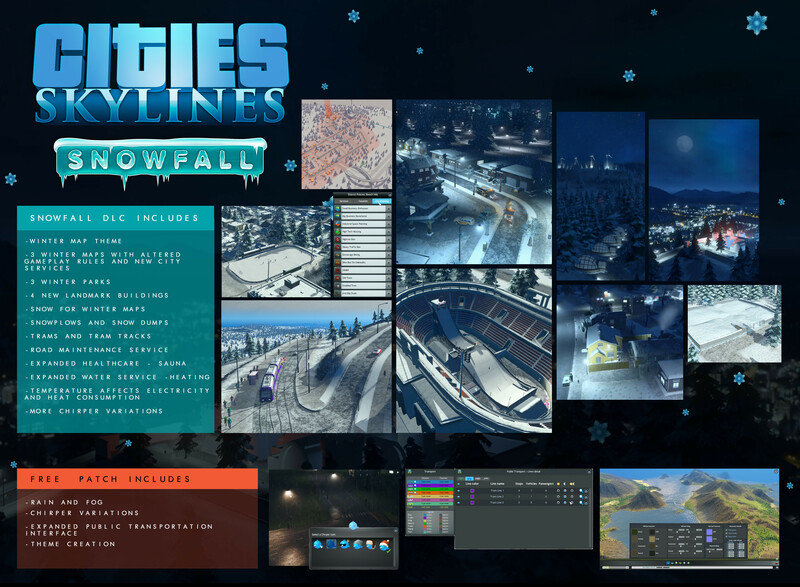 We are of course very excited to bring you another DLC with snow, trams, more buildings and of course hats for Chirpy. The DLC is set to launch some time during the afternoon CET. Having that said - updating a game with the moddability we feature will have its issues. We have worked behind the scenes with a team of the core modders and asset creators to ensure a smooth transition for you all, yet everyone was not available and our resources limited. A few of the more popular mods will stop working with Snowfall. The biggest one we have identified so far that might cause issues is Traffic++. From what we can see the author is currently not active and we don't have any indication on when or if it will be fixed. For users of this mod we recommend disabling it for new saves and only loading it in "ghost mode" for old saves that are reliant on it being activated to work. Beyond this we expect most of the major mods and assets to work with Snowfall without bigger problems. HUGE thanks to the wonderful community members and prominent modders that have worked very hard during our closed testing to bring their creations up to speed. You're awesome! With no further ado, here are the patch notes! WORKSHOP PANEL NOW DO ... INSTEAD OF CUTTING TEXT !!!!! Terrain cliffs and sand have now higher texel density. Terrain cliff and sand textures have been improved and more uniformly tiled relative to different themes. Fixed: Expansion 1: Design: 1x1_Souvenir Shops are built in Leisure Specilization districts. Fixed: An error message appears when attempting to continue a power line by selecting the top-most part of a pylon. Fixed: AI: After loading a saved game, multiple vehicles return to their depot. What should I do to play them ??? I haven't seen this problem listed, so I thought I'd add it to the others: Since the update, my mouse's center and right button have ceased to function, no matter what option I select. The pointer was off-center approx. 1"-2" off a box or item I wanted. I fixed this with no v-sync, but the buttons still do not work. To zoom in, spin, scroll, etc., I have to use the keys. Pointing and left clicking works tho' - ??? The 'sauna' achievement is broken. How come my "snowfall" doesn't work. When i go into the game it stays with the "after dark" version... How do i get snowfall?